Writing everyday is hard. But it shouldn't be. I am at fault, I don't write everyday. I should, but I don't. One of those challenges I am still trying to overcome. However, I am going to start taking a page from my own advice starting now. One way to get yourself to write a few hundred words a day is to simply take a look around where you are at, find something and come up with a narrative around it. 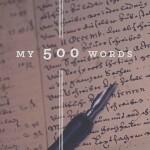 300 to 500 words. Easy. For example, one day at work I arrived and it was storming out. I cracked open my journal and wrote this excerpt about the storm. Whether it's good or bad it irrelevant, this is an unedited, raw entry. I may use this later on, I may not. The point is I created an insight to story just from some dark storm clouds rolling in. You can see the motivation picture here. Black ribbons stretched across the sky as the storm approached. Slowly marching closer was a destructive force that will be talked about for a generation. Townsfolk that hadn't taken the warnings serious were scrambling down Main street looking for any shop still open. Wood, nails, tarps, ammo, food all were cleared off the shelves weeks ago. Procrastination may be their final mistake. An event of myth and lore, not believed by the masses, yet feared by the elders was not about to hit the island world. No one is sure where the storm comes from. Travelers have said it appears from the heavens, others say it spews out of the acid sea. Once it forms it stays for years, disappearing with as little reason as its birth. Not for 10 generations has the storm crossed the shores, long enough to be forgotten and disbelieved. The emerald sky rolling over to a deathly black has everyone believing today. The air is still, quiet, not a sound to be heard. The normal rings of the ship's bells have ceased, the bustle of the markets silent, any sound of life of a neighbor to song bird is not heard. All eyes fixed on the waves of clouds about to crash on the small nation. Legend talks about the calm before the storm, if the silence is a measure of what's to come then we may not survive the night. Maybe the woman walking into the office is on an espionage mission, the man leaving work early is heading to see his mistress, the plane flying over head has a mechanical problem, the bird sitting in the tree is observing the people, every item on your desk or in your car has a story. Write about it. Whatever you want. Exercises abound and you are writing about it. You don't need to write a work of art or anything you would use, but the simple act of practicing writing is honing your skills for your real masterpieces.